This article was written By Adam Douglas on 10 Mar 2011, and is filed under Reviews. There’s a reason foreign comedies don’t often make it into theaters or onto DVD, and that’s because comedy doesn’t translate well. Think about it: the majority of foreign films that receive any kind of distribution overseas tend to be dramas, thrillers, and horror films. Conflict, tension, fear—these are universal human emotions and part of the human condition. The things that scare people in other countries tend to scare us as well. But when it comes to what makes us laugh, well, you can’t get more subjective than that. How many times have you flipped past a foreign sit-com on cable and thought, that’s not funny at all? It’s either too broad, or (in the case of a lot of British humor) too dry. The Mexican Bumblebee Man on The Simpsons is a perfect example of this. Funny to them, worthy of derision and scorn to us. There are a lot of reasons for this, aside from just cultural differences. Comedy tends towards the timely rather than the timeless, and unless you’re deeply involved in the culture being reflected in the film you’re just not going to get the joke. Even watching a comedic film from ten years ago can cast you into a kind of limbo—you know it’s supposed to be funny; maybe you even remember laughing when it first came out, but now thanks to the passing of time, you’ve forgotten all about whatever zeitgeist is being parodied. Linguistic jokes also get lost in translation. How do you translate a pun so that it not only makes sense but is funny as well? There are exceptions, of course. There are always exceptions. Situational comedy can overcome cultural and linguistic boundaries, getting into a kind of filmic juggling act. The French film La Cage Aux Folles (1978) is a masterpiece of situational comedy. You don’t need to be knee-deep in French culture to understand good comedic timing. Likewise Jacques Tati’s Play Time (1967). The lengthy restaurant sequence is a perfect example of situational comedy as juggling act, in which more and more elements are thrown up in the air. The fun is in watching the balancing act and marveling at how it all holds together. Steal It If You Can (a.k.a. 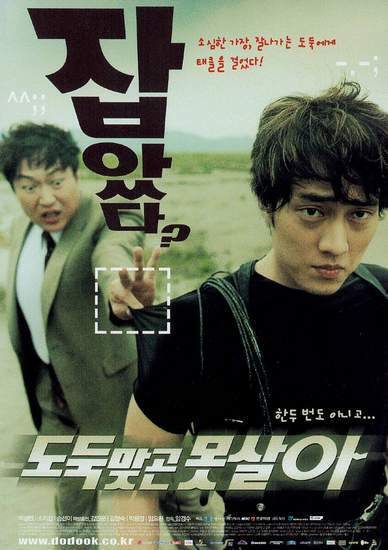 Can’t Live Without Robbery), a 2002 comedy from Korea, succeeds (just barely!) because it wisely keeps the action confined to a limited space. It sets up the premise, as absurd as it may be, and lets the scenes spool out, building on one another until the climax. At numerous times I was ready to give up, anticipating an unfunny turn of events, but the movie always managed to surprise me and make me laugh, stopping just short of “too broad” and catching me unaware. Kang Sang-tae (played by a wide-eyed Park Sang-myun) is a civil servant who has married into money. He lives with his beautiful wife, Hwang Ma-ri (Song Seon-mi), perfect in every way except for a lack of taste buds, which makes her hobby of cooking all the more absurd, and two kids. The family lives in an isolated home, the first and only house built in a subdivision that was never completed. Although his life looks perfect from the outside, Sang-tae is becoming estranged from his wife, and his kids are embarrassed to be seen with him and his clunky car. Enter the antagonist: Choi Kang-jo (So Ji-seob), a video game designer who gets his kicks breaking into people’s homes and stealing inconsequential items. After targeting Sang-tae’s home and stealing some food (and becoming intrigued by Ma-ri’s unusual culinary creations) he begins to make it a regular thing, entering into a kind of cat and mouse game with the homeowner. At first, Sang-tae goes to the police who are less then helpful, even admitting that their own station has been burgled a few times, but eventually decides to take on the burglar on his own. The home, removed from the rest of society, becomes a kind of war zone, with the family rallying around Sang-tae. The intruder has united the family and given the wife and kids a reason to respect Sang-tae, who steps up to the plate without hesitation, even enrolling in self-defense classes at the local taekwondo dojo. Although the movie almost goes off the rails here, with the martial arts master instructing Sang-tae in the best way to kick the burglar in the nuts, it not only recovers from this absurdity but also improbably incorporates it into the hilarious climactic battle, which borrows liberally from Hong Kong films, still a big influence on Korean cinema at the time. Steal It If You Can is not a perfect movie by any stretch of the imagination but it does manage to be funnier than expected, and is a good example of how comedy can sometimes cross cultural borders.